The SEA-PHAGES Laboratory is a laboratory course at Detroit Mercy sponsored by the Howard Hughes Medical Institute (HHMI) Science Education Alliance. The lab is designed to give students a unique mentored research experience in their freshman year. 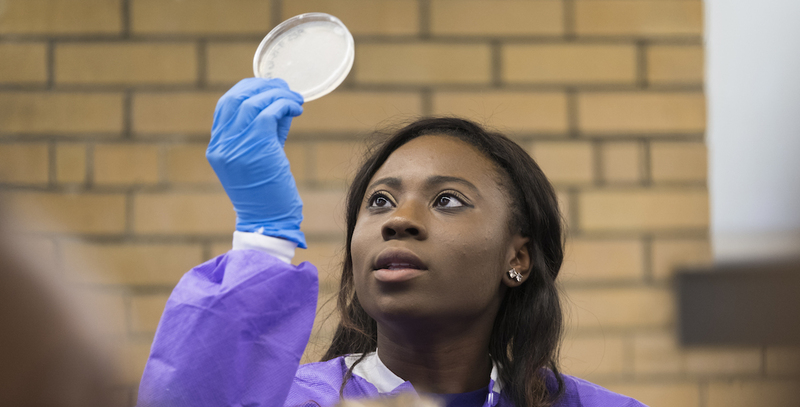 Students will be part of a larger national consortium to isolate and characterize new bacteriophage (viruses that infect bacteria). The program duration is one full year. In the Fall semester, students will collect soil samples from a variety of environmental sources. From those samples, bacteriophage will be isolated, puriﬁed and ampliﬁed in the laboratory. 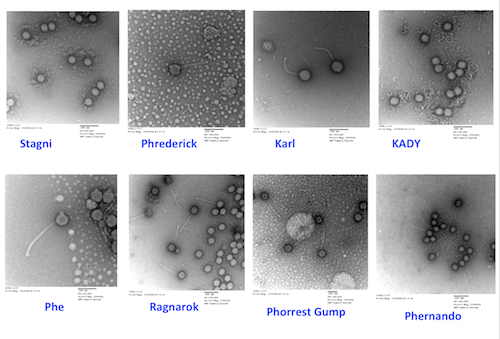 The morphology of puriﬁed phages will be examined by electron microscopy. Phage genomic DNA will be puriﬁed and characterized by restriction enzyme analysis and then DNA will be sent to a sequencing center to be “decoded”. In the Winter semester, upon receiving ﬁnished genome sequences, students will annotate genomes, i.e., assign genes and functions, via bioinformatics tools. Bacteriophages represent one of the major catalysts for evolutionary change in biological systems. These nano-sized particles are viruses which infect host – bacteria and then carry out their life cycles. Phages have the capacity to shuttle not only between diﬀerent bacteria but between diﬀerent bacterial species, sometimes carrying bacterial genes with them. This form of lateral gene transfer is hypothesized to be a major contributor to the emergence of bacteria with new properties, i.e. acquired antibiotic resistance. Developing an understanding of the actual role of phage in these and other environmental processes and their own rapid evolution are exciting areas of research that encompass diverse disciplines such as microbiology, molecular biology, bioinformatics/genomics and ecology. Become part of a research team that isolates, identiﬁes and characterizes unique phages from nature as we seek to uncover their roles in the environment and evolution as a SEA-PHAGES Scholar. Do you want to participate in this amazing research opportunity?